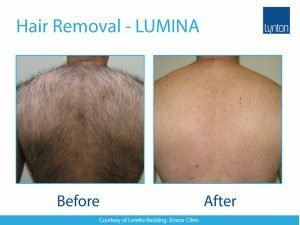 Safe, long-term hair removal for men and women for the whole body. 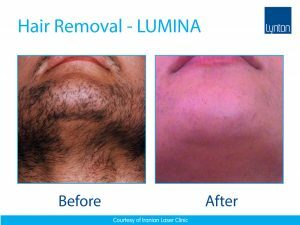 Unwanted hair removal is one of the most common aesthetic treatments carried out in the UK via Laser. Unwanted hair may want to be removed due to being unsightly, but it can also be due to medical reasons. Some of our female patients suffer from unwanted hair in the facial area due to Poly-Cystic Ovary Syndrome – laser treatment can be very effective for these patients. 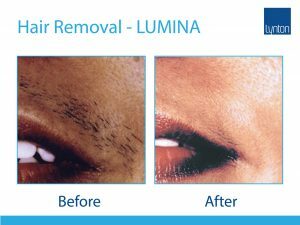 We offer a simple and effective hair removal treatment at our clinic in Leeds. With the Lynton Lumina, we can get achieve beautifully smooth skin within just a few treatments. Light is absorbed by melanin, the pigment found in hair follicles. The light energy heats the pigment and destroys the hair follicle. How is the treatment completed? The laser applicator is placed on the skin and a short pulse of light is released. This will target many follicles at the same time. If you have fairer skin and darker hair, the treatment is more suitable for these types of skin. Dark hair is easily treated and has a higher concentration melanin. Immediately after treatment, the skin may be slightly red. Hair Follicles can also become bumpy and red but will dissipate in a few hours. Usually 4-12 Treatments of 10-15 mins will be sufficient for most skin types. For more difficult treatments, a longer course may be needed.